Navua based agricultural company Grace Road Group successfully demonstrates how innovative farming methods, passion and a strong desire for quality can lead to excellence. Since its establishment in 2014, the group has focused on developing its rice production for Fiji to ultimately become self-sufficient. It was this drive and ethos of Grace Road Group towards food security that was rewarded during the Prime Minister’s International Business Awards as the company won the Primary Industry Business Excellence Award. 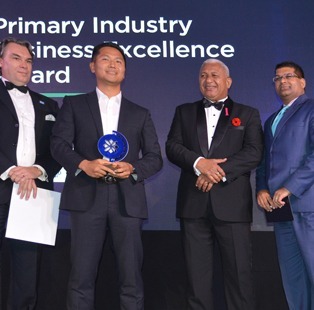 Proudly supported by the Reserve Bank of Fiji, the Primary Industry Business Excellence Award recognizes a company who has sustainability and inclusivity at the heart of its business strategy while maximising profit out of these important resources. The award is presented to a company for outstanding export results in agriculture, forestry and fisheries through innovative ideas such as value addition but at the same time taking into account sustainability of such resources. “Grace Road Group has strategically positioned quality management at the heart of all of its business operations to achieve full value chain and to reinforce sustainability. “The group ensures that all products are safe and healthy by relying on a vertical integrated approach to manage from seed production down to the distribution for quality control without the need to question where they come from. “It even avoids adding preservatives, artificial flavorings, and any other synthetic ingredients to create food with integrity and to improve food culture,” said Grace Road Group public relations manager Grace Park. Grace Road Group has within the three years of its operation successfully established eight local limited liability companies, providing employment opportunities to more than 100 Fijians. Grace Road Group continues to invest in the agriculture sector and as a result has formed a partnership with the Fiji National University (FNU) to promote co-operation in the field of Agriculture Education and Technical and Vocational Education and Training (TVET). Grace Road Group established the Agriculture Training Institution in Navua, which features a conference hall, four lecture halls, a library, dormitories and a research center. Annually, about 200 students will be provided theoretical training at the institute and are able to acquire the required practical skills on the adjacent farm. Fiji National University vice chancellor Professor Nigel Healey says this partnership will go a long way in skills development of Fijian agricultural students. “Grace Road Group has different breeds of rice which they are experimenting with to identify the type that will grow best, given the climatic and soil conditions in Navua. “The partnership will allow FNU students to work with farm experts and gain knowledge about new and modern farming techniques as well as share ideas on best farming practices. “Students will be able to apply this knowledge on their farms or with farmers and agricultural enthusiasts,” Professor Healy said. Investment Fiji chief executive officer, Godo Mueller- Teut congratulated Grace Road Group. “The company has a strong focus on quality, value addition and sustainable agricultural practices. “Their push towards sustainable farming practices, educational training, strong growth, import substitution and tenacity towards elevating Fiji’s agro processing sector is impressive,” Mr Mueller- Teut said.